Join the discussion on our forums! Come discuss War Master Voone over in our dedicated War Master Voone discussion topic. Step 1: Pray that you get Voone from a pack like I did. If that doesn't work, craft him. Even though what I said above works and happened to me today, this guy is crazy. You literally almost double the value of your hand. The only dragon I can think you wouldn't want two copies of is the Ebon Smith dude and Deathwing. Pretty much it. Wait til you have Deathwing and either Zola the Gorgon or Youthful Brewmaster in hand. Congrats, now you’ve got four Deathwings. Play three of them with The Boomship, push damage and draw opponent’s hard removals and heavy taunt minions while he panics, keeping your fourth Deathwing for when your other three have been taken out. Can you copy ALL dragons in your hand? I'm sorry for not being to read. So let me get this straight: War Master Voone is bonkers, of that there is no doubt. But why dragons? This guy is as loyal to his loa as a goblin merchant in an Alliance VS. Horde war. Why didn't Voone support Akali? Was it because Deathwing deceived him into indentured servitude? Whatever his reasoning is, we may never know why he betrayed his champion. EDIT: Welp, it turns out he knows about dragons thanks to his former experience dabbling in Black Dragonflight shenanigans. I'm dumb. This card is so OP they nerfed it before it's even been released!!! they a-coming boy, get hyped! And they're GOOD! 5 mana shieldmaiden? Yes please!! This card appeals to me because it isn't obvious what you're supposed to do with it. Play a few dragons and get a 4 mana 4/3 draw a card on average? Play a lot of dragons and get a lot of value? Play like one or two specific dragons that become busted when you copy them? You, the deck builder, have to figure that out. 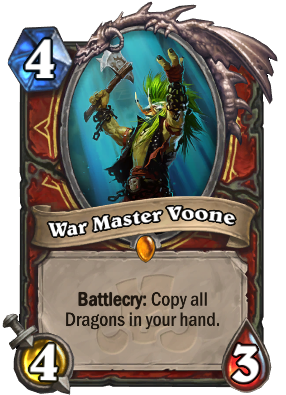 Contrast stuff like Drakonid Operative which basically says "Shoehorn some dragons into your curve and in exchange get a super OP curvestone card." According to the card reveal animation, it's a 5 mana 4/4. The card reveal animation was wrong. Was it wrong, or was it... Wronchi..? sorry i'll leave. Can't wait to copy all my Dragons with this for insane value. What the heck does "copy all dragons" means ? Do you get a copy of each in your hand ? Do you summon them (obviously not...) ? Does it become itself a copy of each one subsequently ? EDIT : Just checked, and the most logical (in terms of mana and usefulness) possibility seems to be the one : It gets you 1 copy of each dragon in your hand.